Australian Phil Hughes remains in a critical condition after being struck on the head by a short-pitched delivery during a first-class domestic match. The 25-year-old batsman is in an induced coma in a Sydney hospital. He underwent scans on Wednesday, but team doctor Peter Brukner said: "Phillip's condition is unchanged and he remains critical." Cricket Australia has also announced that the current round of Sheffield Shield matches has been abandoned. Hughes was carried off on a stretcher after a delivery from New South Wales bowler Sean Abbott struck him on the head, missing his helmet. The South Australia left-hander also needed CPR and mouth-to-mouth resuscitation before he was taken to hospital and placed in an induced coma and had a 90-minute operation to relieve pressure on his brain. "While it's an extraordinary injury in cricket, such head trauma injuries are seen in high-speed car crashes all the time and there are some miracle stories of full recoveries." Peter Larkins, one of Australia's leading sports physicians, said people who suffer serious injuries can remain comatose for days but can still make full recoveries. "While it's an extraordinary injury in cricket, such head trauma injuries are seen in high-speed car crashes all the time and there are some miracle stories of full recoveries," Larkins told Reuters news agency. Members of the Australian national team, including the captain Michael Clarke, have visited Hughes in hospital comforting the stricken player's mother and sister. Sir Ian Botham, Sir Viv Richards and many other past and present players have also tweeted messages of support. Former Australian player Michael Slater also wrote on Twitter that he was "still in shock". New South Wales assistant coach and former Australia fast bowler Geoff Lawson said players and staff were "distraught to a man". He told BBC World Sport: "Phil has spent most of his career playing for New South Wales, some of the guys in the dressing room are some of his very close friends. It's a very sombre dressing room. "Sean Abbott is a rising star of the game, has just been playing a little bit of cricket for Australia and is just on the way there. "He's a very good friend of Phil's, he's out there doing his job, he bowled very well yesterday and bowled a few bouncers and one... you know. He's pretty upset about it. "There's a great depth of feeling for Phil and everyone wants him to recover and get on with being who he was." The match in Sydney was abandoned after the incident. Now Cricket Australia (CA) has said that the games involving Victoria, Western Australia, Queensland and Tasmania have also been called off. "We've spoken to players and the Australian Cricket Association," said Pat Howard, CA's executive general manager of team performance. "Given how players across the country are feeling right now, it's just not the day to be playing cricket and we understand that." The issue of player safety - and the use of helmets in particular - has come under scrutiny following the injury to Hughes. Helmet manufacturer Masuri has revealed that said the Australian was not using its latest design but said they want to fully review the incident before making any conclusions. CA has offered counselling to players who witnessed the incident, but former Australia Test bowler Nathan Bracken told the BBC that players are aware of the potential dangers they face every time they play cricket. The former left-arm seamer also said Hughes and Abbott will have the backing of the wider cricket community. "It appears Phil Hughes was struck by the ball to the rear of the grille and below the back of the shell, missing his [2013 model] Masuri Original Test helmet. This is a vulnerable area of the head and neck that helmets cannot fully protect while enabling batsmen to have full and proper movement." "It's great to see that support for Phil and for Sean," Bracken, 37, told BBC World Sport. 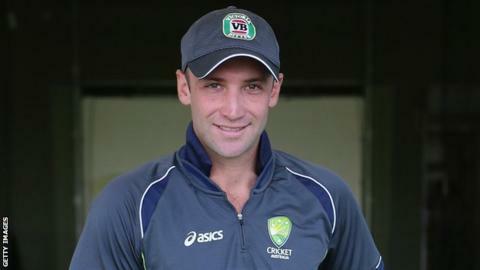 "Phil is a player who is well liked in cricket, a bloke who has worked very very hard to get where he is. "Let's hope the fight that he goes through now gets him back out there doing what he wants to do." Former England fast bowler Peter Lever, who in February 1975 injured Ewen Chatfield with a short-pitched ball that briefly stopped the New Zealand player's heart, expects Abbott to feel great remorse and guilt even though it was not his fault. "He won't sleep, that's for sure," Lever told BBC Radio 5 live. "He will be thinking about it every waking minute. "What he has done governs the other player. He will not be thinking of anyone else except the guy he has hit."